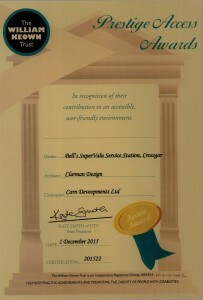 Prestige Access Award in Recognition of our contribution to an accessible, user-friendly environment at SuperValu, Bells of Crossgar. On behalf of our charity we wish to thank you and all your team at Carn Developments for the fantastic work you did on our new centre. We would be less than honest if we did not say we were initially somewhat concerned about dealing with a firm we did not know but our concerns were totally ungrounded. From start to finish it has been a pleasure to work with your organisation. Nothing was a bother and all of your staff and sub-contractors were very co-operative and meticulous. We have to particularly acknowledge the leadership of Peter Campbell, your site foreman. He was an absolute joy to work with. There are two words we would use to describe your firm – quality and professionalism. We would have no hesitation in recommending you for further work of this kind and wish to pass on our sincere thanks. We look forward to the opportunity to publicly recognise the quality of your work at our official opening which we hope you will attend.